The perfect weather for a photograph. All in all, today was a good day – except for the fact that this afternoon I accidentally locked myself out of the office and had to cross town twice to get the key from an office mate who luckily was still around. (Perhaps these days’ stress is taking its toll after all.) As I walked (ran, actually) into town to fetch the key from my friend I couldn’t stop cursing my luck; here was such perfect weather, and my camera was locked inside whilst the sun’s last rays started retreating. Anyway, this story has a happy ending, as some more running later I was back outside with the camera, and thankfully I managed to snap this picture of the Sheldonian before the sun had set. Now it’s not that I don’t have other pictures of the Sheldonian (as another good friend of mine was quick to point out! ), but I do think that each one is a bit different. 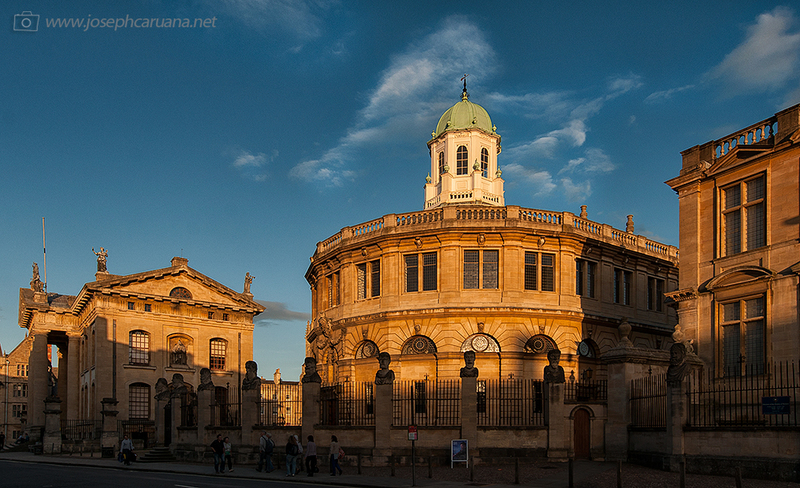 You see, those wispy clouds in the sky above the Sheldonian – now those I certainly didn’t have before, did I? Well, I do now – and that made my day. Oh, and speaking of past photos of the Sheldonian, I recommend you have a look here to see some of the pictures I took of this fine building in the past, and most importantly to notice how the view is ever changing. Enjoy!